AMES, Iowa (AP) — No. 18 Iowa State will be without junior David Montgomery, one of its best players, for the first half of one of the bigger games in school history. 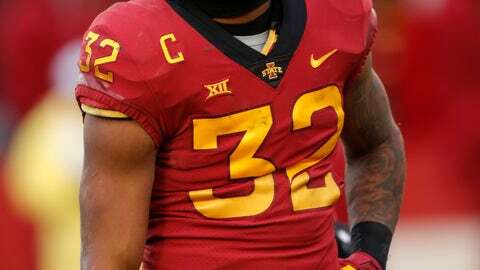 How the Cyclones (6-3, 5-2 Big 12) fare for 30 minutes without their star running back could decide whether they stay alive in the Big 12 title game chase. Montgomery, the Big 12’s second-leading rusher, will miss the first two quarters of Saturday’s showdown at No. 13 Texas (7-3, 5-2) after being ejected for throwing a punch during last week’s win over Baylor. Iowa State didn’t even bother to appeal Montgomery’s suspension, instead chalking it up to a lesson learned and a chance for his backups to respond. The Cyclones own the head-to-head tiebreaker over No. 7 West Virginia. But they need to win out and hope for a Mountaineers loss to make it to the championship game for the first time. Montgomery’s numbers — 765 yards and six touchdowns on 4.5 yards a carry — at times belie his ability, as the third-year back often runs behind a line that has struggled to spring him. But Montgomery is undoubtedly a difference maker, and the kind of player who could easily leave for the NFL draft next spring. The Cyclones’ next-best running threat is freshman quarterback Brock Purdy. But trying to spring Purdy to run wild in open space might be too risky — especially against a physical defense like Texas. The better bet is that the Cyclones will try to cobble together a first-half rushing attack behind reserves Kene Nwangwu, Johnnie Lang and Sheldon Croney. Those three have combined for just 3.1 yards a carry in 69 tries this year, but they say they’re confident they can fill Montgomery’s shoes. Nwangwu is averaging 33 yards on kick returns, and he had 10 carries for 49 yards in a win over Oklahoma State on Oct. 6. Lang, a freshman, is one of the fastest players on the team, and Croney appears to be an option in short-yardage situations. “I feel like whoever is in the game is just going to produce,” Nwangwu said. Campbell said he is not concerned about missing Montgomery for a half, partly because the Cyclones played without him against the Cowboys and scored 48 points. Montgomery’s suspension couldn’t have come at a worse time for the Cyclones, who have won five straight in the league for the first time. But Iowa State has shown an impressive knack for overcoming adversity, bouncing back from a 1-3 start despite losing two starting quarterbacks — Kyle Kempt to injury and Zeb Noland to a transfer — already this season.